If you are a rafting or adventure fan or simply love being in the vicinity of nature then this would be your next spot. VNA camp resort, in Rishikesh, offers a great view of the hills and the river flowing right before you. 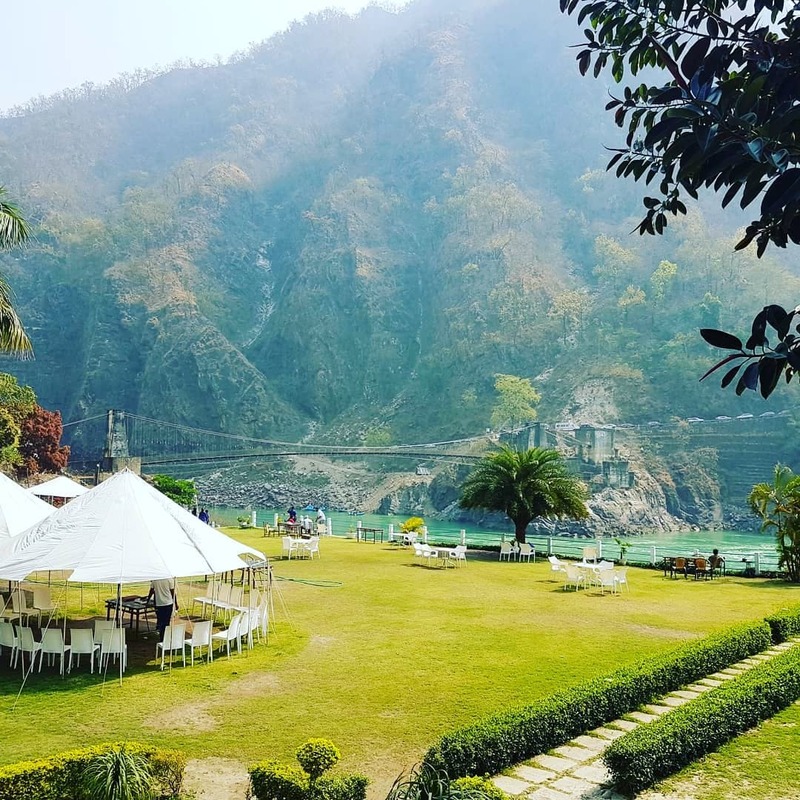 This place is by a beach, next to the river Ganges, which makes it the best place to unwind yourself as you listen to the peaceful sound of water streaming downhill. Another attraction of the place is the hanging bridge, a mini Laxman Jhula, which one has to cross over the river Ganges in order to reach the campsite. The walk over the bridge is an interesting thing that adds to an overall experience. Spread over a sprawling area, all facing the Ganges, the camps are very well-maintained and also have decent food options. The staff here are quite reliable and friendly too. The camps offer a sight to behold that will leave you wanting for more. I happened to be there on a full moon night which added to the beauty of the place as the river looked like a stream of sparkling white gems. There is a beautiful lawn where you can enjoy meals and play with your kids and friends. The best part is the wide open unobstructed view of the river and mountains over the lawns that one can enjoy at any time of the day. We even managed to sleep under the open sky in the shade of the tree with help of the friendly staff. The rafting starts right in front of the campsite and is managed by a certified set of professionals. You can also try other adventure activities like rappelling, cliff jump, burma bridge, etc. My favourite experience was visiting the village and jungle trail trek to explore the pahadi rustic life and mystic jungle paths. There was never a dull moment at our trip as we had a lot to do. We loved playing the beach volleyball, badminton and cricket on banks of river Ganges. Our package was inclusive of breakfast, lunch, afternoon tea, evening snacks, dinner and rafting, which made it an unbeatable offer. All in all, it is a great destination to unwind on a weekend with a view to die for. You can also opt to stay in AC cottages. VNA camp is located at Marine Drive which is 27 km from Rishikesh. The drive is quite scenic all along the river Ganges and people who enjoy being behind the wheel will surely love to hit these roads. Rishikesh is an easy drive from Delhi and this place should be on your bucket list. The service and the dining area could be better. Another thing that may bother people is the parking space that is across the bridge but the authorities will take care of your vehicles well.